This is a verbatim reproduction of the original concept for Korax Arena, published internally on December 30, 2003. The idea itself goes back to at least 2001 (see this forum post). 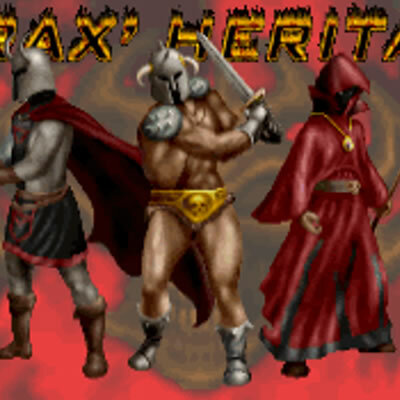 Korax Arena (KA) is a LAN and internet play capable (client/server based) multiplayer-only mod based on Hexen. It includes new gameplay types and RPG elements, as well as stuff from other games (like Heretic). Korax Arena is focused on a fast and furious gameplay in a fantasy environment. It doesn’t include typical Hexen/KMOD features like inventory or Stats Update Screen. There are also no extended games (and thus no save/load functionality). Most game types can be played even for only a couple of minutes and provide a person with an enjoyable gaming experience, but at the same time through the leveling up, the large number of weapons (some of them available only for characters at or above a certain level) and the wide variety of play modes it should provide a rich gaming experience for extended gaming sessions of several hours. Korax Arena will be released to the public early in the development. The goal is to regularly release a working version with new features. Since there is no save/load functionality and no data can be exported or imported, these versions don’t need to be compatible with each other, further simplifying the process and enabling a faster and simpler code through no need for legacy support. The first version, termed 0.1, should contain at the minimum working deathmatch for all 3 original Hexen classes with at least 3-4 weapons each, at least 1-2 maps and a working EXP/Leveling system. Through killing another player or a monster, the player gets experience points (EXP). Until the player disconnects from the server, his EXP is kept throughout any number of matches. While a player loses all weapons and ammo when dying, he retains his EXP, enabling him to catch up to the others faster. Certain weapons/items require a certain level (e.g. only a Level 5 Mage can pick up the Arc of Death). Base HP/Speed/Damage attributes also differ from Level to Level (they are automatically upgraded after pre-defined tables). Characters can’t be generated, a certain character class always starts out with the same attributes (meaning a Level 4 Fighter will always have the same attribute values). Every class starts out with a fixed set of attributes (invisible to the player) which are upgraded at every level after a predefined table (invisible as well). There are several different player classes, each with unique style, abilities and weapons. Beside the original classes of Hexen (Fighter, Cleric, Mage) and the imported player character from Heretic, there might be also more classes, including (but not necessarily) the Assassin from Hexen II, the player character from Witchaven, the marine from DOOM, and possibly others. Every character class has the same number of weapons/spells/items, total 10 (assigned to the keys 1-0). These can include melee weapons (e.g. Gauntlets, Mace), ranged weapons (e.g. Crossbow, Bloodscourge), offensive spells (e.g. Arc of Death, Firestorm), defensive spells (e.g. Repulsion), combat items (e.g. Flechettes), or non-combat items (e.g. Speed). Players starting out at the beginning of the game or respawning after being killed always have weapons #1, #0 (without ammo) and no others. Every weapon (except for the weakest weapon #1 which is always a melee weapon) needs ammo. Ammo comes in 3 different varieties, each of them fueling weapons of every class in the same way: blue mana fuels weapons #2 and #5, green mana #3 and #6, red mana #4 and #7. Weapon #8 is the ultimate weapon of every class and uses ammo of all 3 types at once. Weapon slot #9 is a Repulsion spell (working the same for all classes) that uses Discs of Repulsion for Ammo. The weapon in slot #0 is a kind of hand grenade/bomb, players pick up Flechettes as ammunition for this slot. Flechettes work differently for every player class. Weapons #2-#8 include original Heretic/Hexen weapons/spells/items, variations thereof and new ones as well. There is no inventory like in Hexen. Items lying around are either weapons, ammo, or instant powerups. This latter category includes Health Vial (restores a small amount of health), Quartz Flask (restores a moderate amount of health), Mystic Urn (restores player to full health), Shadowsphere (makes player nearly invisible for a limited time), Invulnerability (makes player invincible against all kind of attacks for a short time), different types of Armor (giving a boost in Armor Class), and more. Work like in any other game, enhanced by players getting experience and leveling up through killing enemy players. Same principle as in other games, enhanced by players getting experience and leveling up through killing enemy players (but in the end it’s still the team scoring more flag drops that wins the day). Like in the original Unreal Tournament, enhanced by players getting experience and leveling up through killing enemy players (but in the end it’s still the team scoring more points that wins the day). There are different control points throughout the game that change color every time a player crosses them. At the end of the game, the team wins that had the most control points for the longest time under control. Another game mode copied from Unreal Tournament. One player team attacks, the other defends. The attackers’ goal is to proceed through a couple of objectives (completion of an objective allows access to the next objective). If the attacker team can complete the last objective before the countdown reaches zero, the two teams switch sides and the former defenders will have to achieve the same goals – but the countdown now starts at the time in which the former attackers reached the goal. At start, one of the players becomes the Heresiarch, which is a very powerful wizard with lots of HP and some formidable spells. It’s basically all other players against the Heresiarch. The player who kills the Heresiarch will become the new Heresiarch (the old Heresiarch respawning as a normal player). You can get points only when killing other players as a Heresiarch. In a large map, an even number of monsters is assigned to every player. Each player has to hunt down his „own” monsters. The player achieving this first (or the player who killed the highest number of own monsters when the time limit is reached) will be the winner. Players can kill each other and get EXP. Monsters will attack any player on sight, regardless of color. Monsters killed by the player they are assigned to will give EXP to that player, disappear from the map and increase his count by one. Monsters killed by another player will not give EXP and will respawn after a couple of seconds at a random spot in the map. Each team tries to push the floating ball as many times into the enemy team’s goal area as possible. After a goal, the ball gets back to the center and all players are force-teleported to the designated start spots. By killing enemy players, you can get EXP and level up, but the winning team will be regardless of the number of frags the team with more goals. This game type is a bit on the strategy side. Each player has his own base, where he can summon monsters. The base consists of a Summoning Circle, an Obelisk of Life, and some static defenses, including walls, traps (which activate only when foes walk over/by them) and a catapult hurling fireballs which can be aimed at mid-to-long distances (similar to the ones in the Hexen map „Cannons”). Monsters can only be summoned in the Summoning Circle. This takes a certain amount of time in which the player is frozen, i.e. can’t move or shoot. A Summoning can be canceled any time, in which case no monster appears and the gold is added back to the stockpile. Each monster requires a certain amount of gold to summon. Gold can be collected lying around the map (respawns after a time). Also, when killing enemy monsters or players, sometimes gold appears. Monsters will attack enemy players and monsters on sight. Monsters can be assigned to either defending the base (they’ll not cross a certain line around the base), to attack the enemy’s base (they’ll start out towards the enemy base and fight any foes they encounter along the way), or follow the player (they’ll follow the player at a short distance, fighting any foes they encounter, but never straining farther from the player’s side than a defined distance). The goal of each player is to destroy the Obelisk of Life at the enemy’s base (which has a lot of HP). Any player whose Obelisk is destroyed loses the game by default and drops out of the game, all his summoned monsters exploding at the place they currently are (some of them dropping gold). This has no influence on one-on-one matches but in a Summon Contest with three or more players where the kicked player had many monsters, this could make quite an impact. Taken from the Western Shooter „Outlaws”. There is a chicken somewhere in the map. The first task is to find and pick it up. Whoever has the chicken can kill any other player (EXP EXP), any other player can shoot only the player with the chicken. At the end of the game, the player who had the chicken for the longest time (total) is the winner. There is a pig running around the map squealing. Your task is to find it and let your henchmen club it to death. Every player has a number of Ettins (wearing a butcher’s apron and brandishing spiked clubs) at his disposal who will follow him. His task is to find the pig, find some means to not let it run away, and let his henchmen club it to death (pig has a lot more HP than in Hexen). At the same time, player has to stop other players’ henchmen from killing the pig. Ettins will automatically attack the pig if in sight and other Ettins/players if the pig isn’t in sight. Players can kill each other or the other player’s Ettins, getting EXP for either. If an Ettins is killed, it’ll respawn after a certain time in the vicinity of the player. Once the pig is butchered, it will respawn at some other part of the map and start running around once again. The winner is the player whose henchmen butchered the pig the most time within the time limit.